The Church of the Holy Name of Jesus invites anyone who may be interested in the ancient Latin Mass to attend any Sunday at 11:00 a.m. 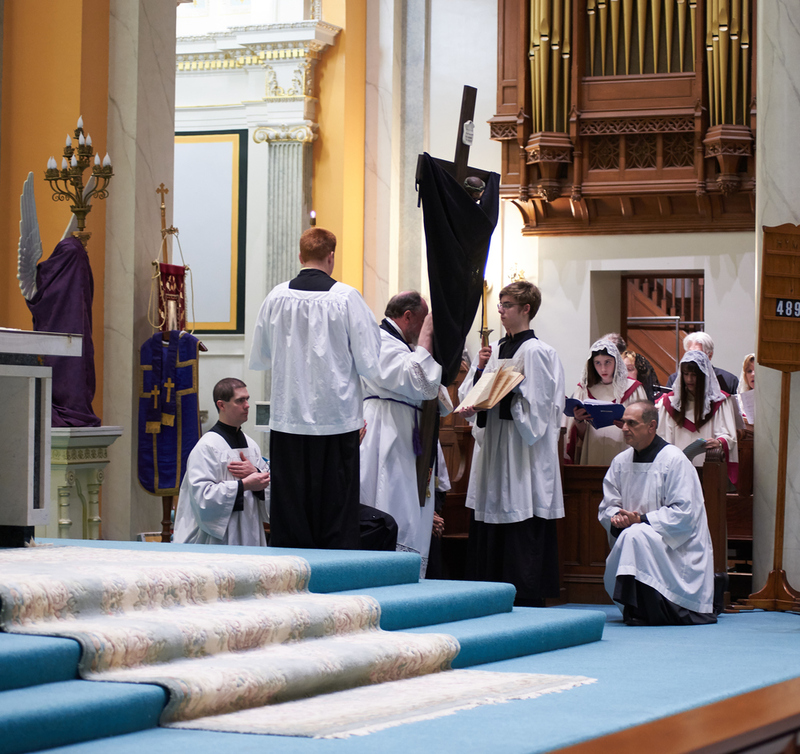 If you&apos;ve never been to the Tridentine Mass, this page was designed to address some questions you may have and to serve as a primer to the Mass. For more in-depth information, browse the listing of related resources on this site or by directing any question you may have to the pastor. For Catholics, the Mass is the central act of Divine worship. The Mass is, first of all, a sacrifice--an act by which the Church gives to Almighty God, officially and in the name of all, the worship that is due to Him alone. Indeed, the Mass is the unbloody representation of Christ&apos;s sacrifice on Calvary. And for two thousand years, Catholics have been obeying the command of Jesus Christ at the Last Supper: "Do this in memory of Me." In the Holy Sacrifice of the Mass, Jesus Christ, through the ministry of the priest, offers Himself to God in an unbloody manner under the appearances of bread and wine. Christ thereby enables us through himself to adore God in a suitable manner, to thank Him for his favors, to render Him full satisfaction for sin by offering the sacrifice of Calvary, and to petition Him with our needs. After the Sacrifice is completed on the Altar, the faithful receive Communion which is the very Body, Blood, Soul and Divinity of Christ under the appearance of mere bread. This is what is known as the Catholic Doctrine of the Real Presence. The Crucifix above the Altar reminds us that the Sacrifice of the Cross and the Holy Sacrifice of the Mass are one and the same. The four accounts of the Last Supper in the Gospels of Matthew, Mark, Luke and in First Corinthians give us the nucleus of the liturgy that is found in the Mass today. In the earliest times, the Mass was celebrated with--but distinct from--a Christianized synagogue service. Over the centuries, the ceremony developed with prayers, formulae and movements crystallizing into set forms. There are various reports on when the Latin language was first used for the Mass, but there is evidence that it was used in Rome when St. Peter was there because it is doubtful the Romans would have accepted a liturgy in any other language. The traditional Latin Mass in all its essentials was passed on by St. Peter, the first pope, to the Church. The Apostles themselves, according to St. Ambrose, worked at its elaboration, and the Mass reached its complete perfection with Popes St. Damasus (in the fourth century) and St. Gregory the Great (in the sixth century). As the great liturgical scholar, Father Adrian Fortescue, wrote, this Mass is "the most venerable in all Christendom, with a history of unbroken use far longer than that of any Eastern rite, there being no doubt that the essential parts of the Mass are of Apostolic origin." The name "Tridentine" is derived from the Council of Trent, which was convoked in the mid-sixteenth century in response to the Protestant Revolt. Following the Council in 1570, Pope St. Pius V published the new, restored Missal. But the rite of Mass codified after the Council of Trent--the so-called Tridentine rite--was not a new form of the Mass. Pope St. Pius V&apos;s liturgy dates back essentially unchanged to the time of St. Gregory the Great in the sixth century (though that liturgy lasted a full three hours!). Pius V&apos;s Bull Quo Primum granted priests the right to use the Tridentine rite forever, without scruple of conscience or fear of penalty. With the exception of minor modifications, the Tridentine rite was essentially the rite used throughout the western Church until the introduction of the new Missal of Pope Paul VI in 1970 following the Second Vatican Council. The Council itself declared its desire to preserve and foster all lawfully acknowledged rites, and even after the introduction of the new Missal, permission was still given for the use of the old rite. The Council, in Sacrosanctum Concilium #4, said "Holy Mother Church holds all lawfully acknowledged rites to be of equal authority and dignity [and] she wishes to preserve them in the future and to foster them in every way." In 1984, the Vatican&apos;s Congregation for Divine Worship, in response to requests from Catholics around the world, granted a wider permission for the celebration of the Tridentine rite. Four years later, in the binding papal document Ecclesia Dei, Pope John Paul II declared that respect must be shown everywhere for the feelings of all those attached to the old Latin Mass by a wide and generous permission for celebration of the old rite. The Church of the Holy Name of Jesus celebrates the Tridentine Mass according to the liturgical books of 1962 with the permission of the local bishop--which was granted in 1994 by His Excellency Louis Gelineau and has been graciously continued by His Excellency Robert Mulvee. Permission has also been granted to designate The Church of the Holy Name of Jesus as an "open" parish. This means that anyone who resides in the Diocese of Providence (which includes all of Rhode Island) may become a parishioner of The Church of the Holy Name of Jesus to attend the Latin Mass. The Tridentine Mass is celebrated in the official language of the Roman Catholic Church: Latin (with the exception of the reading of the Epistle and Gospel in English after being read in Latin and the sermon). The unchanging nature of the Latin language has preserved the orthodox doctrine of the Mass, handed down from the Apostles and the early Church Fathers. The use of Latin is not the only difference you&apos;ll notice between the Tridentine Mass and the new Mass. The priest and servers face away from the people and towards the Altar. Only at certain times during the Mass does the priest turn to face the people: when greeting them with the "Dominus vobiscum" ("The Lord be with you"), when blessing them, and when preaching to them from the pulpit. You&apos;ll also notice that the priest prays in different tones: secret, medium and clear. Indeed, not all prayers in the Mass are meant to be heard by the faithful. Rather, the priest often speaks directly to God on behalf of Man. At The Church of the Holy Name of Jesus we have Latin-English Mass books that are available as you enter the Church. They contain the full text of the Mass with a side-by-side translation from Latin to English so that you may follow the priest&apos;s words and actions at the Altar. The books include directions about when to stand, kneel and sit during the Mass and offer helpful prayers for both before Mass and after Communion. The readings at the Tridentine Mass will be different from the new Mass readings. Rather than the four readings (i.e, from the Old Testament, Responsorial Psalm, the Epistle and Gospel), the traditional Mass has only two readings (i.e., the Epistle and Gospel) at Mass. A small (but valuable) sampling of links to traditional Catholic liturgy pages and resources can be found on our listing of related resources. Compiled from selections of Kieron Wood, Father M.E. Morrison, and The Catholic Encyclopedia. The traditional Eucharistic Fast calls for a minimum of three (3) hours of fasting before receiving Holy Communion. For those who wish, fasting from midnight before the Mass is commendable. Please maintain a reverential silence before and after Mass out of respect for the Most Blessed Sacrament in the Tabernacle and for those attending Mass who wish to pray or meditate. Only baptized Catholics in a state of grace (i.e., having confessed all mortal sins to a priest) are invited to receive Holy Communion. Communion is received in the kneeling position at the Communion rail and on the tongue. The faithful must not pick up the consecrated host. The communicant does NOT say "Amen" in response to the priest&apos;s "Corpus Dominie nostri...."
The priest alone sings or recites the "Pater Noster" (i.e., the "Our Father"). The choir or congregation respond only at the end with "Sed libera nos a malo." Having the people recite the "Pater Noster" is an innovation from De Musica Sacra (3 Sept.1958), issued by the Sacred Congregation of Rites. It authorized the faithful to say the Pater Noster with the celebrant in Latin during a dialogue Mass, but ONLY in a Low Mass. Accordingly, this innovation is discouraged at Holy Name. Holy Name does not stipulate a dress code for Mass, but churchgoers are reminded that they will be in the presence of the Most Blessed Sacrament. KNEEL: Beginning of Holy Mass; at the Sanctus; at the Agnus Dei; at the Final Blessing; and when the Bishop passes. SIT: At the readings of the Epistle and at the Sermon. STAND: When the priest enters/leaves the church; at the Gospel; at the Creed; at the Pater Noster; and at the Last Gospel. ALSO: The faithful who wish to receive Holy Communion should begin to approach the Communion Rail after the recitation of the "Domine non sum dignus...." of the priest.